Last week, an unconfirmed report revealed that there will be no new footage shown during the Star Wars: The Force Awakens panel at Comic-Con, which took place today. As it turns out, that report was true, since fans didn't see a trailer or any other scenes from the film. However, fans did get a special treat with a behind-the-scenes video, which offers a glimpse into life on the set and guess what? It had plenty of new footage featuring aliens, spaceships, and even a first look at Princess Leia! Fans at San Diego Comic-Con's Hall H were treated to a special look behind the scenes of Star Wars:The Force Awakens by director J.J. Abrams, producer and Lucasfilm President Kathleen Kennedy and writer Lawrence Kasdan. The filmmakers were joined on stage by cast members Daisy Ridley, John Boyega, Adam Driver, Oscar Isaac, Domhnall Gleeson, Gwendoline Christie, Mark Hamill, Carrie Fisher and Harrison Ford to the surprise and delight of fans. At the end of the Hall H presentation, the entire Hall H audience of more than 6,000 fans were all invited to continue the celebration and join cast and filmmakers at a surprise Star Wars Fan Concert. The San Diego Symphony performed the classic Star Wars music from John Williams at the Embarcadero Marina Park South. Stay connected with StarWars.com and the official Star Wars app. All Star Wars, All the Time, Anywhere. Download Star Wars for free from the Apple App Store or Google Play. 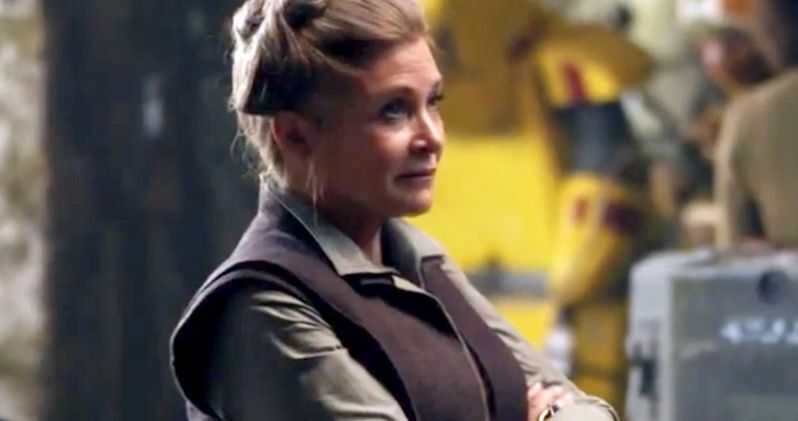 If you look closely, this video also contains our first look at Carrie Fisher's Princess Leia. You may recall that, last month, there was a photo that reportedly leaked from a costume fitting featuring Princess Leia, but its authenticity was never verified. In the video below, we get our first real look at Carrie Fisher as Leia, in a brief shot that comes at the 2:58 mark of the video. If you compare the image below along with the second video, which showed the leaked photo for the first time, you'll see there is some resemblance to her costume. Still, aside from this brief behind-the-scenes shot, we haven't seen Leia in action at all, as she wasn't shown in either of the first two trailers, and neither was Mark Hamill's Luke Skywalker. The filmmakers revealed during today's panel that the next trailer will debut sometime this fall, but we don't have an exact release date yet. Until more details are released, take a look at the Princess Leia photo, the full https://movieweb.com/comic-con/Comic-Con behind-the-scenes video, and stay tuned for more on Star Wars: The Force Awakens, in theaters December 18.